Sulzer has been contracted to inspect and repair the bogie frames of 76 rail vehicles over the next two years, as part of the ongoing maintenance and refurbishment project of the Docklands Light Railway (DLR). The project requires considerable attention to detail, especially with regard to the quality processes and documentation, as well as a streamlined welding and machining operation capable of completing each vehicle on time. 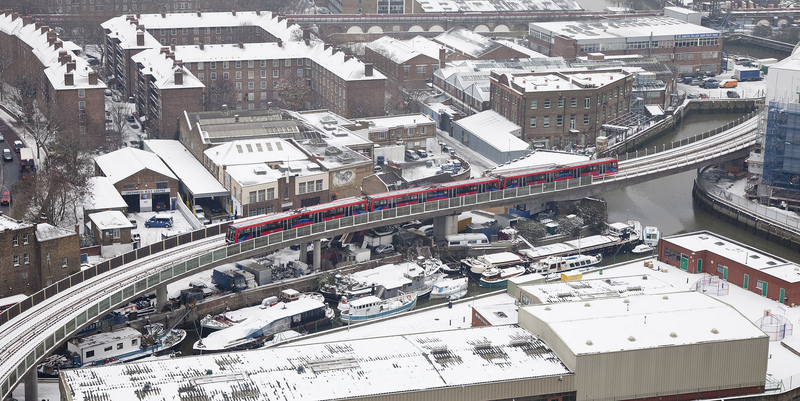 Originally opened in 1987, the DLR consisted of 15 stations and ran 11 single-car trains. Today, this has expanded considerably to 45 stations and 149 vehicles, many operating in three car formations. DLR is the owner of the rolling stock and it has contracted the operation and maintenance of the trains to the KeolisAmey Docklands (KAD) joint venture. Through regular periodic inspections carried out on the rolling stock it was noticed that some of the fabricated sub frames were developing cracks. In order to resolve this issue and to extend the original service life of the bogies, a refurbishment programme was instigated to inspect and repair all 228 units as well as permit the bogies to be used beyond their original intended lifespan. Within the scope of the project was the requirement to adopt some very specific quality assurance processes and documentation. It was Sulzer’s ability to work to these requirements that set it apart. Sulzer offered a flexible approach, which also benefitted the UK service network with the opportunity to widen the company’s existing accreditations in order to meet the requirements of this project. Extensive experience within the mechanical service centres, namely York, was instrumental in obtaining all of the necessary qualifications for this contract, including a qualification for the rail industry supplier qualification scheme (RISQS). Implementing this and a number of other industry-specific quality assurance procedures was key to getting this project off the ground. The KAD servicing schedule is fourteen days long for each vehicle; once it is taken out of service, it has to be stripped down and rebuilt in the two week period. Each vehicle is equipped with two motor bogies and one trailer bogie, which, including transportation, allows Sulzer just 12 days to turnaround all three bogies. Each project begins with 48 hours notice that the bogies are due to arrive in Avonmouth Service Centre, where they are initially steam-cleaned and shot-blasted to BS EN ISO 8501-01. Following this, each frame is inspected dimensionally to ensure that it has not become twisted during operation, after which all of the welds are checked using magnetic particle inspection (MPI). In addition, non-destructive testing (NDT) methods are adopted. First, a visual inspection of all the welds is performed, with any weld that is considered sub-standard excavated and re-welded. The frame is then inspected again, using both liquid penetrative inspection (LPI) and MPI. At each and every step of the process, photographs are taken and test results are recorded for the quality documentation. One of the main practical issues for the service centre is determining how long each frame will take to repair. Some frames may be almost beyond economic repair and require several days in the welding facility; others present only minor issues for repair. This disparity requires considerable flexibility in terms of working hours and can require the welders to operate on a shift basis in order to complete each set of frames on time. Clearly, due to the importance of these frames and the welds that hold them together, it is essential to have appropriately coded welders, with their qualifications included within the quality assurance documentation. Darren Colley, General Manager at Sulzer’s Avonmouth Service Centre, commented: “Due to the safety implications of such work, DLR required some extraordinary quality assurance procedures to be implemented, a commitment that Sulzer was more than willing to undertake. Due to the flexible project management processes within Sulzer, the company is able to adapt and comply with some exceptional requests when required. Once the welds have been checked and repaired, the bogie frame undergoes another dimensional check to ensure the welding of the frame has not created any distortion, with all of these readings recorded. Having completed the welding, the frame passes to the machining department within the service centre. Located on the bogies there are eight pads that hold the suspension units in position and over time these pads wear. In the machining area, the pads are measured and then a calculated amount of material is removed to allow a 3mm shim to be installed and bring the overall pad thickness back to the original specification. At the same time, the pads are drilled and tapped so that the shims can be attached with countersunk bolts. Once the machining is complete the set of bogies is painted to a pre-determined specification, with a further 24 hours required for the paint to dry. Again all of the process details are recorded and presented in the final quality assurance documentation that accompanies each frame back to the customer. Each bogie frame weighs around 750kg, making it difficult to handle and awkward to gain access to the weld locations. To ensure that all of the engineers working on the frames could easily access every section, the Avonmouth Service Centre fabricated three bespoke ‘gyroscope’ frames that allowed the workpiece to be rotated and held in place. 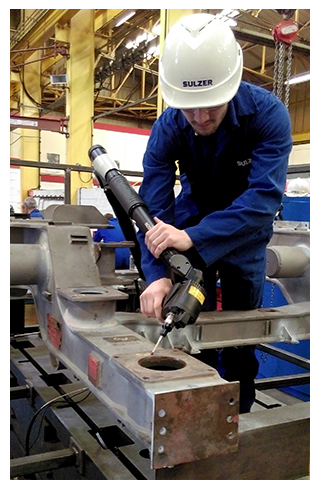 Due to the bogie repairs playing a central role in the refurbishment of each vehicle, it is vital that Sulzer returns each frame within the timeframe described in the contract. To date, every frame that has passed through the process has been returned on time. Visitors of Railtex 2017 (9th–11th May at the National Exhibition Centre in Birmingham, UK) will be able to meet Sulzer representatives at stand P11.